It’s been just over a week since the race for the chairmanship of the House Science Committee got into gear, but a frontrunner has already emerged. Earlier this week Space News reported that Rep. Lamar Smith (R-TX) is the “odds-on favorite,” in the words of one source, to lead the committee in the next Congress. Yesterday, Science magazine’s ScienceInsider column also indicated that Smith was the most likely member to succeed Rep. Ralph Hall (R-TX), who is stepping down from the committee chairmanship because of term limits. The science being returned from mars is showing radiation levels on the mars surface is about the same as in LEO so the martian atmosphere is blocking it. What does this mean in the budgeting for destinations? More of a push for mars? Why would it mean that? One in a million problems the cult denies turns out to be slightly less of a problem. We’ve spent all of NASA history wit nothing more than PowerPoint sci-fi about sending our diapered heroes to Mars. Another hundred years or so of presentations won’t hurt (as long as you don’t make normal people attend them). what is it that you’re trying to accomplish here? your posts are neither entertaining nor insightful. only the same misanthropic drivel over and over again. seriously, you contribute nothing here, you’re just annoying. we should start calling you the grinch. I love the “grinch” business too. Romney’s comment seems to be apropos when it comes to astronaut fans. They think of the feds as Santa Claus, a never-ending source of accountability-free goodies. Anybody who suggests that the feds should stick to funding things in this area that are actually important to national goals such as security, science, and encouraging real commerce, are “the grinch” who is “stealing” (i.e. refusing to fund) the freebies. The article said i was about half that measured in space during the flight. Not clear how much of the drop is due to planetary shielding, i.e. in the surface the planet blocks half the sky. Still much higher than normal Earth background. But I agree, hazard for astronauts is manageable. Agreed, they said the flight out would be twice as bad… so we have to cut the flight time there and get them on the ground. All the more reason to delay traveling or landing on mars until we have a vehicle that can do the road trips there. We’ve had vehicles going to Mars for many decades now, of course. They just didn’t have our celestial pilgrims on board. Which means they could actually get something useful done. And could do it on a real-world budget, instead of in the fantasy politics-of-the-future. Thanks for this important news, but what manned Mars flight enthusiasts fail to take into consideration is that if the chances of life on Mars go up, then so do the costs of clearing the back contamination problem. I still think a rover going up Valles Marineris in Mars science priority 1. I call it “Powell”. I am not a Mars flight enthusiast. If we can not routinely fly the 200 miles, we are really putting the cart before horse thinking 35 million is a starting point. If we do fly out that far, there will be the hue and cry for why aren’t you landing, those costs seems to usually price you out of it all together. Fuel handling, I believe, should be a priority, and the shift from the disposable Apollo model and move to space based, reusable vehicles. We do not need to fly past our frontier of GEO and the bulk of our assests to develop and mature the technologies. Right about the fuel, and propulsion systems, and systems generally. Dan Goldin had planned to test technologies for turning Mars’ atmosphere into methane fuel in his Mars Sample Return Architecture. As far as Sensenbrenner goes, Goldin had planned to have manned systems for the EELV’s, with no US reliance on anyone for transport to ISS. If memory serves (and sometimes it does not), Sensenbrenner helped kill those. I hope others here will have been closer and know more about that. I am still waiting for the delivery of a simple report from OSTP to the Congress on how to the US government agencies should coordinate in dealing with an approaching impactor. At least something to serve as a basis for discussion. I have impact research on my desk to circulate to the impact research community. Election season is over, and B612 needs some donations. Due to NASA’s failures to do its work, I do not get to have “fun” thinking about manned Mars flight. My guess is that the Mars surface radiation levels are being under-reported. I wish Musk the best of luck. I hope Rohrabcher’s fellow Republicans do not call him a “communist” for pointing out obvious hurdles in dealing with these two problems. Given party loyalties, and the other states’ delegations, and their launch and space industries, my guess is that Smith will get the chairmanship, with Rohrabacher quietly doing a whole lot of the work behind the scenes, particularly in dealing with “difficult” areas. I thought this was about the politics of space? The following is copied directly from the website of Lamar Smith, supporting his belief that climate change is a fabrication of the liberal press and the liberal scientific community, which are both inveterate liars. He believes scientific truth is whatever his ideology decides it is. His main qualification to command America’s federal science research seems to be that he won a prize in a science fair in high school. Congressman Lamar Smith, chairman of the Congressional Media Fairness Caucus, today awarded ABC, CBS and NBC the “Lap Dog Award” for media bias in a speech on the House Floor. The Lap Dog Award is given weekly for the national news coverage that most glaringly exemplifies slanted, subjective, and otherwise sycophantic reporting/shilling. “ABC, CBS, and NBC are the winners of this week’s Media Fairness Caucus’ highly un-coveted ‘Lap Dog Award’ for the most glaring example of media bias. “The networks took two weeks to devote any coverage to the ‘Climategate’ scandal on their evening news programs. “We now know that prominent scientists were so determined to advance the idea of human-made global warming that they worked together to hide contradictory temperature data. “But for two weeks, none of the networks gave the scandal any coverage on their evening news programs. And when they finally did cover it, their reporting was largely slanted in favor of global warming alarmists. “The networks have shown a steady pattern of bias on climate change. During a six-month period, four out of five network news reports failed to acknowledge any dissenting opinions about global warming, according to a Business and Media Institute study. Al of Congressman Smith’s comments are correct. All you need to do is spend a bit of time reading through the actual data to discover that this whole Global Warming er, Climate Change er, Climate Chaos is much ado about nothing more than natural variability. Historically, CO2 increases follow warming. We are still coming out of the intense cold years of the Little Ice Age and have yet to warm up to the levels seen during either the Medieval Warm Period OR the Roman Warm Period. 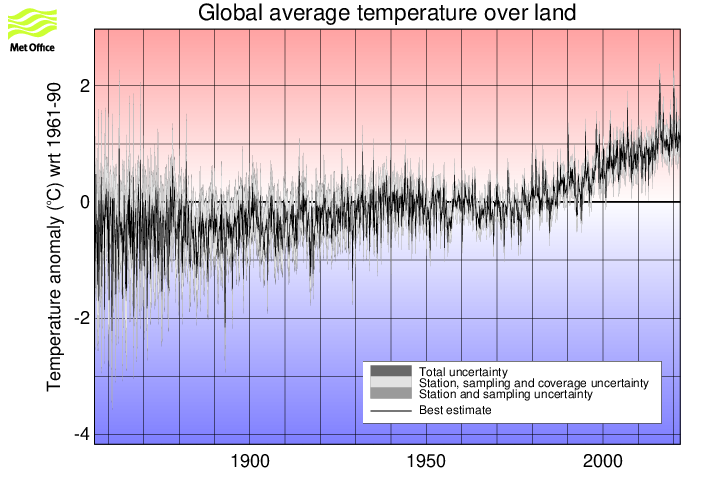 There has been no warming in the past 15 years despite an increase in the level of CO2 in the atmosphere. Spend some time on WUWT.com and you’ll understand Congressman Smith’s statements about media bias. No, but that’s what (non)skepticalscience and the Guardian would have you believe. Criminal thief and forger Peter Gleik is obviously a poor reference. Don’t believe what I say, go look at the data yourself. Believe me, living in Vermont I’d like to think that our planet was gradually warming up to more livable year round temps, because I know that a return to a cooling phase would be very difficult for my retirement years. I’ll take those sources over your unreferenced and data-absent statement. I’ll take a doctorate, MacArthur Fellow, and member of the National Academy of Sciences over an uncredentialed individual who throws unsubstantiated claims of theft and forgery at the same. None of which support your claim that “there has been no warming in the past 15 years.” Your GISS chart shows an upward trend, and even the endpoints in 2012 are higher than the endpoints in 1996. With an endpoint in 2010, your NOAA chart doesn’t cover the “past 15 years”, but still shows a 0.2-0.3C increase from 1995-2010. 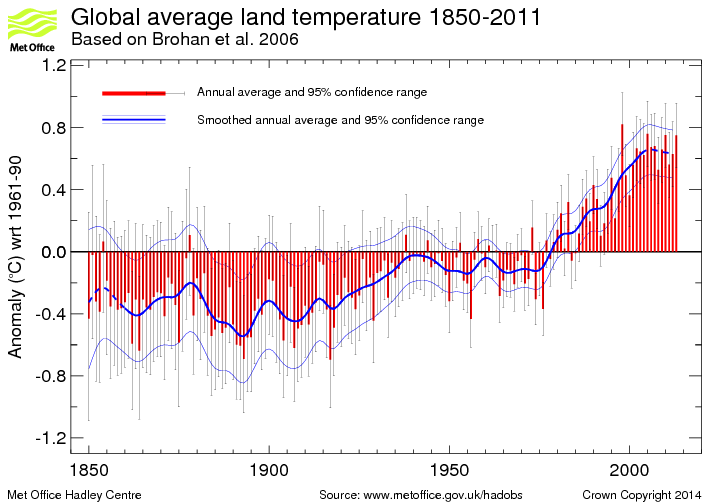 Your first UK chart shows a 0.2C increase from 1996-2011. Maybe your last UK chart supports your contention, but it’s so ridden with error bars as to be unreadable. As Gleik states, you can support almost any statement about climate by carefully cherry-picking data from small periods of time. But you can’t even cherry-pick the right data to support your statement. Even if I am wrong(or rather, if the non-alarmist scientists are wrong), mitigation will be far less expensive than imposing third world status on the first world via carbon schemes to drive the cost of energy up to that of “renewable” energy sources. As much as it is preferable, we simply cannot supply our nation’s energy needs (domestic and industry) without fossil fuels. I am all for continued development of wind, solar, nuclear, and anything else that adds to the plus side of our energy balance, but so far it looks like everything that’s being implemented (or even in the planning stage) will only cover about 3-5% of our current energy needs. Germany is backing WAY off from their “total commitment” to green energy as they see the real cost of the energy that gets produced via wind farms. I’ll stop commenting after this as, other than addressing the correctness or anti-science nature of Congressman Smith’s statements, it is straying off topic. I’ll end with a link that Dark Blue Nine (whose comments I have always enjoyed reading) will probably have an issue with. Again, everyone should look at the data themselves and decide if it is wise to bankrupt our country based on climate models that cannot predict 3 years in advance, much less 20 or more. Texas is oil country. Naturally, those who own wells and refineries do not want to hear about any possible side effects of their products. We currently do not know how the variability of our Sun affects the Earths climate, and thus we can not know with certainty the effects of any gases we release into the atmosphere. NASA has unique abilities to get the information needed to provide firm answers to those questions. In the meantime, there’s a lot that needs to be done to make our economy more energy efficient. The solar constant is measured today with great precision (from space) so any variations in solar output can be incorporated into current models, as long a NASA still has funding to maintain the monitoring program. NASA won’t be able to answer these questions if some of the Republican leaders of the House Science Committee have their way, as they want to stop funding science that doesn’t support their ideology. There is nothing “constant” about our Sun’s output. No “solar constant”. And that includes all types of particles. Do you know how much our farmers would benefit if we could get an accurate 12 month weather forecast? Well, we can’t, not with our current computer models. For me, that climate science has far more importance than Mars science. But then so do accretion studies. Regarding solar irradiance, the variation is about .1% and the term “constant” is traditional. It can only be directly measured from space, although indirect measurements have identified several cycles of 11, 88, 208 and 1000 years which are incorporated in climate models. Again, without NASA climate research funding it isn’t possible to collect actual data. Would you then support or oppose Congressman Posey (R-FL) statement that climate research funding should be removed from the NASA budget? If we can arrive at a consensus that climate research should continue, with NASA support, whatever the results, then that would be a step toward the truth, regardless of what that truth turns out to be. Those very roughly defined cycles you mention appear to be related the difference between our Sun’s center of gravity and our Solar System’s center of gravity, and the effect of that on the fusion containment of our Sun. Once again, please stop using the term “solar constant”, as it whisped away into the aether. We must arrive at a consensus that climate research should continue, with NASA support, whatever the results, as regardless of what that truth turns out to be, it is vital to our nation’s well being. See my comment on agriculture above, and note that this has serious bearing on the water supplies of many states as well. Mayor Bloomberg may have his view, but right now we don’t if Coronal Mass Ejections played a role in Sandy, or if AGW intesified Sandy; and we need to know, unless the nation is planning on going out of business in a short while. Just sign me as a Raging middle of the road moderate. By the way, you’re not including all types of particles when you speak of the variability in irradiance. You also need to look closely at the angle of luminence between the Earth and Sun. But does anyone have any information on what the radiation environment is on the Mars surface? Somewhere I have been reading that its not as bad as people had thought and I guess I could do more research but perhaps someone here could thumbnail it coherently for me? Curiosity (first lander with capability for radiation measurements) apparently reported radiation levels on the Marian surface “similar to those on the ISS”, and “about half what was measured in space”. Typical ISS exposure rates are 15-30 REM/yr. This is still much higher than typical background levels on the ground on Earth but is usually considered acceptable for up to a year or so on the ISS. While chronic (several years) low-dose radiation exposure such as this would increase long-term cancer risk somewhat it would not cause acute medical problems that would interfere with the mission. The prime risk in spaceflight is disintegration of the vehicle, so people in this line of work are usually willing to accept some risk. BTW high-time airline pilots have higher radiation exposure as well, and SFAIK no one keeps track of them in any specific way. The high rate of cataracts in high-time high-altitude pilots may be related to cosmic ray exposure. Lest I be misunderstood here, Jeff’s topic was handicapping the chairmanship race, not stating who we want to win. As my late uncle, a close student of the equine arts put it, place and show often pay better than win. As so many of my Native friends face their own nations’ Day of Mourning, I just want to mention the great, great space comedy “Interplanetary” in Shock-o-rama. Be sure to get a copy for your holiday viewing. The anti-science party that openly cultivates the silliness of Planet Earth being all of 6,000 years old; the party with elected officials publicly refuting the Big Bang and embracing brontosaurus flatulence as a source cause for global warming has no business leading a science committee in the Congress of the United States. Not funny. Go rent “Interplanetary”. Which of these three believes that the earth is 6,000 years old?